A deceptively simple question – how do you update a progress bar from a ForEach loop – popped up on the Google+ OmniThreadLibrary community. 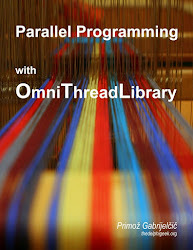 The implementation turned out to be quite tricky so I created an example (55_ForEachProgress) which is now part of the OmniThreadLibrary SVN repository. The starting point was a simple Parallel.ForEach loop which I further simplified in the demo. // update the progress bar - how? We cannot simply update the progress bar from the ForEach executor as that code executes in a background thread and one must never ever access VCL GUI from a background thread! It is also no good to send “please update” Windows messages to main thread as Parallel.ForEach is by default blocking – it waits for all workers to stop working – and messages won’t be processed during ForEach execution.